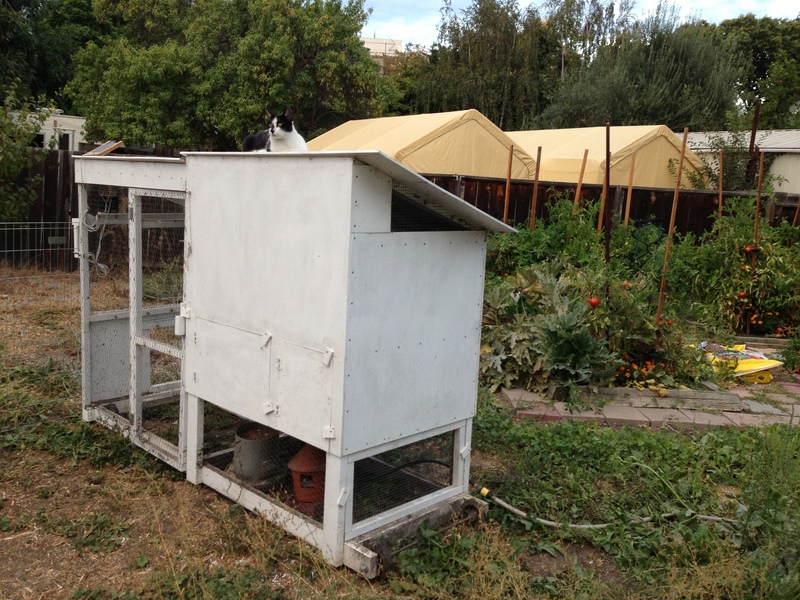 The Hennebago is a true chicken tractor — that is, a chicken coop on wheels, without a floor, so it can be moved around the yard easily. Wherever the Hennebago goes, the chickens peck the ground clean of vegetation, and leave behind fertilizer! Cleaning the Hennebago is a breeze, as one whole side opens up for easy hose-out. The hens can remain confined in the Hennebago’s small run — in which case we move the tractor daily. We can also open the little gate at the bottom and set up a portable “puppy yard” to create little play place — in which case we move the tractor weekly. This summer, we set the girls to work clearing the whole back forty, and they’re having a blast. The Hennebago is a simple, unglamorous, highly functional portable henhouse that an ordinary mortal can keep in a dumpy back yard. It easily accommodates our flock of four hens, Batman (Black Australorp), Lucia (Rhode Island Red), Ladybird (Silver-Laced Wyandotte), and Nevaeh (Americauna). They all share one nest box. The girls have the run of the entire yard, yet they sleep safe at night, thanks to the handy electric door with a light sensor and a little solar panel that recharges the battery so it doesn’t need a cord from the house. The girls run around all day, then put themselves to roost at dusk and the door shuts at dark. A waterer with a float-valve keeps fresh water available 24/7. Ice-cold honey lemonade made with our own lemons and very local honey from our neighbors’ beehive. I’ll probably serve baked goodies, too.